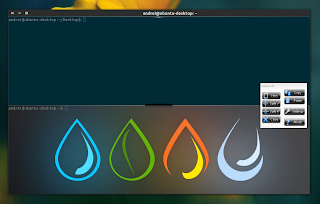 Terminology is a relatively new terminal emulator written for the Enlightenment desktop, but it can be used in other desktop environments. The application comes with many cool features, some of which do not exist in any other terminal emulator. 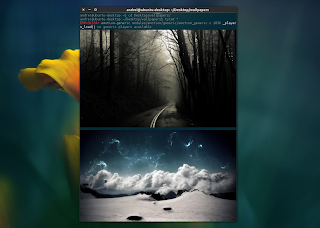 Besides features that are already available in other terminal emulators such as split views support, Terminology can do a lot of things you wouldn't expect from a terminal emulator, like displaying thumbnails for images, videos and documents and furthermore, it also allows you to preview those files directly from Terminology. 1. To set a background image use "tybg image.jpg" (where "image.jpg" is the image you want to use). The background can be a jpg, png and you can even use animated backgrounds, such as videos for instance. To reset the background, use: tybg ""
2. To get a list of files with thumbnails, use "tyls -m". Please note that in my test under Ubuntu, the thumbnails only showed up for some image files, probably because of some missing dependency. Clicking on the thumbnail opens the Terminology external file previewer. 3. To preview a file, besides clicking on the thumbnail as stated above, you can also use "find /path/to/some/folder", etc., for example "find ~/Videos", and then click on the file - the full path is required so this won't work for "ls" for instance. You can also use "typop file". You can also preview a file in the terminal by using "tycat file". 4. To switch between tabs, use Ctrl + PageUp / PageDown. These keyboard shortcuts are hardcoded for now so you can't change them. Terminology is included by default in Bodhi Linux (which is based on Ubuntu) so if you're running Bodhi, it should already be installed. You can also use the Enlightenment Foundation Libraries stable PPA, but currently this PPA provides Terminology 0.2 (the latest being 0.3). Arch Linux users can install Terminology via AUR. 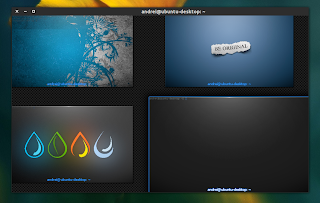 For other Linux distributions, get Terminology from HERE.